We at Atmosphere ID are passionate about design and want it to be accessible to all regardless of budget. Many people think that design is often only for elite. Well not anymore! We’re excited to introduce some budget conscience packages we’ve created to help you create a space you feel at home in. 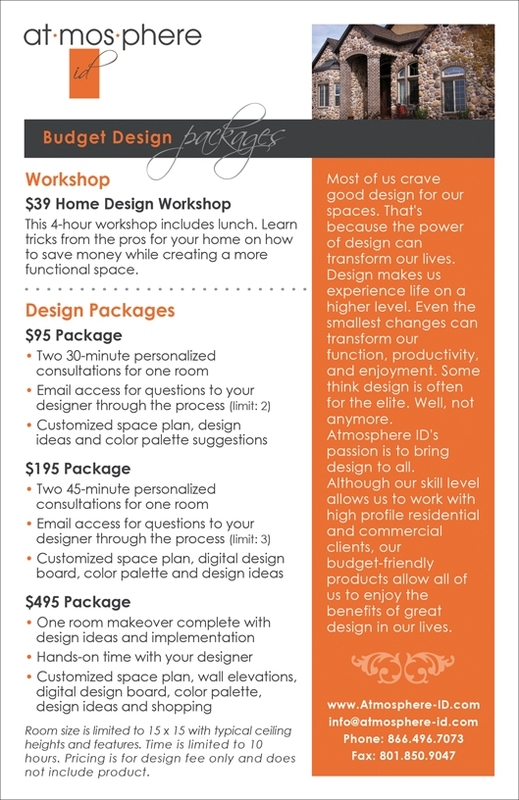 The packages start at $95 and are geared to those who want to design their own space but could use a little help from the professionals. Click on the flier below or visit our website for more information. To celebrate the launch of these packages we’re doing a give away (or 2 to be precise)!!! One winner will receive a free $95 package and another will receive a free $195 package. To enter just leave a comment stating which room you could use a little help with. The winners will be selected randomly on Aug. 25. Good luck! The prices listed on the flier are special introductory prices. The packages will return their regular price on Nov. 1, 2010. If you’ve always wanted a designer look to your space but couldn’t quite figure out how to acheive it now is the perfect time. 6 Responses to Weekend GIVEAWAY!! I’d love the free give away on my living room. I have no original ideas and would love some great, unique ones. Thanks for doing the drawing. I would love some help with the living room or dining room, there are doorways and windows and archways in the most inconvenient places. I need professional help to come to my aid! Thanks for entering me into your contest. I need help in my master bedroom. I want that room to be a retreat from the craziness of family life. Somewhere I can relax in peace and quiet, get a great night of sleep, and feel energized and ready to face the day’s challenges in the morning. Since we just moved in to our home, my bedroom consists of furniture and bare walls!! Help…please and thank you! I would definitely do my kitchen most importantly, and my master bedroom next. I would like help with my basement living area. It is one big room with a ton of wall space and NO windows. There are four doors that shoot off of it (three in one corner) to a bathroom, two bedrooms and a laundry room. I just cannot seem to get it together and I am going to go crazy looking at blank tan walls! This opportunity for professional help would be so very fortunate for my family.